The raised venison pie is closest to the old-fashioned pasty made from hot-water crust or sturdy short-crust. The pastry is moulded, by hand or by machine for small pies, or by hand in large, elaborate fluted moulds for large pies. A filling of roughly chopped or coarsely minced venison is used; shin is quoted as a good cut. Black pepper and salt are the usual seasonings; other spices may be added to the maker’s taste, and some recipes include redcurrant jelly. The juxtaposition of heather-clad moor and wild coastline gives Exmoor its singular magic. The Dunster B&B Millstream Cottage (01643 821966; www.millstreamcottagedunster.co.uk) is close to the coast, and guests can work off smoked haddock and poached eggs on a stroll to the National Trust’s Dunster Castle. More walking-along the wooded valley of the River Mole or the moor-can be enjoyed from the peaceful Heasley House (01598 740213; www.exmoor-hotel.co.uk). This Georgian dower house won The Good Hotel Guide’s Devon Hotel of the Year 2010. Try the friendly Royal Oak Inn at Withypool (01643 831506; www.royaloakwithypool.co.uk), on the River Barle, or The White Horse, Exford (01643 831229; www.exmoor-whitehorse.co.uk), with its famous Dalesman Bar. In the coastal hamlet of Martinhoe, The Old Rectory Hotel (01598 763368; www.oldrectoryhotel.co.uk) is a welcoming retreat with a reputation for great hospitality. Hidden in the village of Kentisbury on the edge of the moor is Georgian gem Beachborough Country House (01271 882487; www.beachboroughcountryhouse.co.uk), set in four acres of gardens. On the coast, there are guillemots, razorbills, kittiwakes and ravens, as well as rare peregrine falcons, and curlews and oystercatchers on the salt marshes at Porlock. 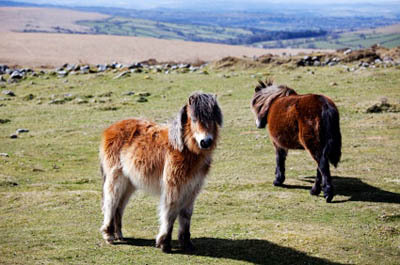 There is plenty of fish-including salmon and trout-in Exmoor’s 300 miles of rivers and streams, but the area is best known for some of its larger residents: the privately owned but free-ranging Exmoor ponies, Britain’s oldest native pony, and healthy red deer population. But it’s also an important habitat for butterflies: the Chains Geological Conservation Review site on north Exmoor has a large population of the nationally rare heath fritillary.